The average household makes at least 2 trips to the grocery store every week. This report shows despite online grocery options, traditional supermarkets are still thriving. Still, supermarkets and food processors must keep safety first to avoid lawsuits and stay profitable. Supermarkets face lawsuits from a variety of sources. The best defense combines mitigation procedures and comprehensive umbrella insurance just in case a mishap occurs, since all it takes is a single incident to breach the limits of most commercial general liability (CGL) policies. Here we will discuss common lawsuits for supermarkets and food processors as well as brief suggestions for mitigation protocols. Protecting your operation from damaging lawsuits is a team effort, and everyone must be on board – from the highest levels of management to the newest rank and file team members. Slip and fall accidents cause 1 million trips to the emergency room per year, according to the National Floor Safety Institute. Such accidents are prevalent in supermarkets and retail stores. Older shoppers are particularly vulnerable to serious injury in a slip and fall. To combat accidents, supermarket staff must be diligent about floor safety. Common problem areas include produce sections, areas where products were spilled, and entrance and exit areas. Mats and rugs must be inspected to ensure they aren’t slipping or lifting. Floor safety is a team effort and must stay top of mind for all staff. Management should develop protocols for floor safety checks and ensure compliance. The American with Disabilities Act (ADA) prohibits discrimination to customers or employees based on disability. While the act addresses many areas, the part of most concern to a supermarket is Title III – public accommodations. The section sets the minimum standards for accessibility as well as reasonable accommodations. Unfortunately, ADA lawsuits are not uncommon. In 2018, seven plaintiffs brought a lawsuit against supermarket Aldi, claiming the chain is not in ADA-compliant. The lawsuit alleges the parking lots at least two stores have too much slope, and there is no wheelchair van parking access. Avoiding an ADA lawsuit demands familiarity with the titles, proper store design and layout, and extensive employee training on how to provide reasonable accommodations. While food processors are likely closed to the public, so don’t have much exposure to ADA lawsuits, allergen contamination is a significant concern. Since 2004, potential allergens are the leading cause of recalls. During the same year, the Food Allergen Labeling and Consumer Protection Act went into effect. So far this year, allergen-related recalls have been issued by at least three food companies. Food processors must employ stringent avoidance and training protocols to prevent allergen contamination in their plant. Most allergen recalls are caused by contamination during manufacturing or mislabeling. Awareness and diligence from the top down will help curb the likelihood of a lawsuit or recall. Supermarkets also have exposure when it comes to food contamination. 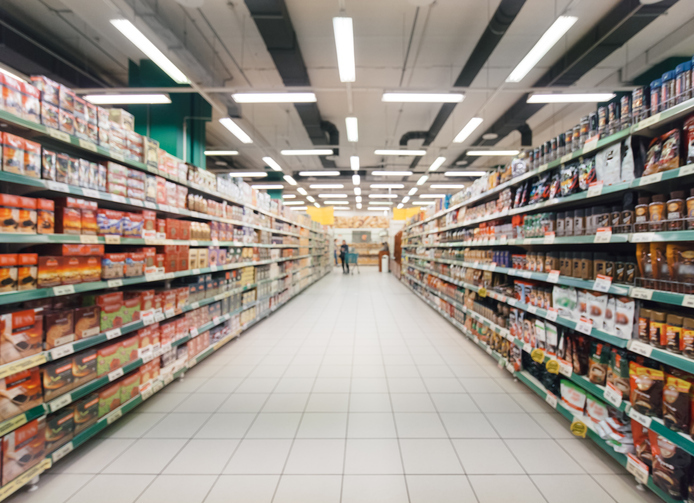 As supermarkets expand their services to include free tastings, prepared food offerings, and salad bars, their exposure to a foodborne illness outbreak or contamination grows. Food handling safety and certification can help prepare workers involved in prepared foods as to the proper procedures when dealing with cooked food. Danger zones include food temperature, sterilization, and cross-contamination with other foods. Self-serve food bars are cropping up in supermarkets. While such a feature may act as a profitable revenue stream for supermarkets, there is the potential for problems and lawsuits. Misidentifying a food item on the salad bar can result in a life threating allergy attack. Products containing any of the big eight food allergens (milk, eggs, peanuts, shellfish, soy, wheat, fish, or tree nuts) deserve special labeling and attention from workers. Further, temperatures must be carefully monitored to defend against the growth of bacteria that can cause food poisoning. Proper training in food handling, extensive sanitation practices as well as careful attention to labeling is a must. As supermarkets change their operations to increase profitability, exposure to lawsuits arises. Delivery services, dining areas, salad bars, and prepared food offerings demand specific safety and risk mitigation protocols. Likewise, food processors are more susceptible than ever to lawsuits surrounding food contaminations. 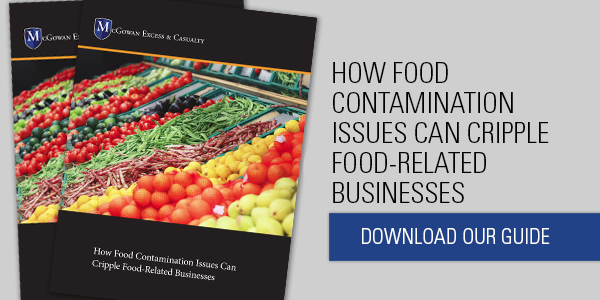 Every type of food business along the supply chain has exposure that must be mitigated with training, safety protocols, and sufficient insurance protection. 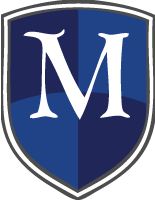 Work with McGowan to make sure your food-related risks are protected. McGowan’s Excess and Casualty Program offers comprehensive protection for hundreds of risks including fast food restaurants, grocers, food processors and manufacturers, and fine dining establishments.